1.5 gpm low flow saves you up to 40% in shower-based water and energy consumption, which equals $19 per month! Save the hot water that you leave running before you get in the shower with the Evolve ShowerStart Roadrunner Low Flow Showerhead. This clever showerhead holds the hot water in until it's ready to use. That means the Roadrunner will save you up to 8 gallons of water for every 5-minute showers you take! 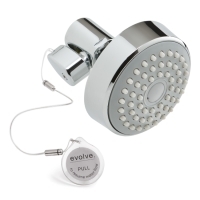 The Evolve Roadrunner Showerhead is a non-aerating, low flow showerhead. The ShowerStart™ technology behind the Roadrunner monitors the water temperature and “triggers a trickle as soon as the water reaches 95 F (35 C). When you hear the “hot water is ready trickle, simply flip the switch on the showerhead to start your warm, luxurious shower. When you're done, the showerhead automatically resets itself for the next shower. So, there's no more guessing or guilt about running hot water down the drain – only the newfound freedom of knowing you're actually saving hot water, while your shower is warming! ShowerStart™ technology behind the 1.59 gpm low flow showerhead will save you up to $246 and 8,212 gallons** of water and energy per year! Pressure Compensating Technology means you will have consistent, even pressure regardless of water pressure. 54-nozzle, full face spray means you will enjoy the comfort and warmth of the better coverage. * Full spray pattern: nozzles are throughout spray face and all nozzles are same shape and size. ** Based on family of 3 saving as little as one minute of hot water per shower (1.5 gpm vs. 2.5 gpm at $0.03/gallon hot water cost). Twist off the existing showerhead; if you need pliers, first put a small towel over the showerhead for better grip and protection. Wrap plumber's tape in a clockwise direction 5 or more times around the shower pipe. Hand tighten your new showerhead onto the shower pipe as tight as possible. Turn the water on and check for leaks; if leaking occurs, hand tightening again. If leaking continues, use pliers to tighten; but first cover the showerhead with a small towel for better grip and protection. Check again for leaks, and repeat above step as necessary. Solid brass fittings will attach to any shower arm with industry standard 1/2” fittings! Please note the showerhead, as with all Evolve ShowerStart series water savers, is not suitable for use with tankless water heaters. If you need more help, watch Installing a Low-Flow Showerhead: A Sierra Club Green Tip. Turn on the water as you would normally start the shower. Stand back or feel free to step away, while cold water flows out of the showerhead. When hot water is ready, the water will start to trickle. Step in the shower, and pull the cord to turn the hot water on full blast! The 3-year warranty is valid from date of purchase. Applies to the original purchaser who properly registered the product within 10 days of purchase. Limited to repairing or replacing, at the manufacturer's sole option, any such defective products. Does not apply to equipment damaged by accident, negligence, or misapplication; or altered or modified in any way.